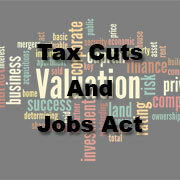 The Tax Cuts and Jobs Act is expected to have far-reaching effects that will vary significantly from company to company. In general, the new law lowers business tax rates. But it also reduces or eliminates various business tax breaks, while expanding others, either permanently or temporarily. Here’s a brief summary of the changes and how they affect business valuations. Everyone is talking about the new tax law — including financial experts who specialize in business valuations. When valuing a private business, experts must consider the economic conditions, industry trends and regulatory environment that exist on the valuation date. In general, they can consider only what’s known (or knowable) on the valuation date. This includes any relevant legislation that’s in effect (or likely to pass) on the valuation date. On December 22, 2017, President Trump signed the Tax Cuts and Jobs Act (TCJA). It brings sweeping changes to the tax code, which generally went into effect at the start of 2018. Many of the provisions for businesses are permanent, indexed annually for inflation. But some business-related provisions are only temporary. When valuing a private business interest as of the end of 2017, it’s essential to consider how this landmark piece of legislation will affect its value. Accounting professionals are still working through all of the details of the 479-page tax law in order to fully understand how it will affect each client and the IRS will gradually publish guidance. 1. Will earnings increase or decrease? In general, most businesses will pay less in federal income tax due to lower tax rates starting in 2018. In turn, lower taxes will result in higher after-tax profits and cash flow, which translates into higher value. But the amount of benefits received will vary — and it’s possible that some businesses (such as certain professional service firms and multinationals) could be adversely affected by the TCJA. 2. Will any incremental cash flow be used? Some companies will reinvest in their businesses by hiring employees or buying equipment (especially since there are enhanced depreciation tax breaks as part of the TCJA). Those options will typically provide growth opportunities and potentially add value. But other companies will use the extra cash to, say, pay dividends or reduce debt. Those options won’t necessarily grow the business, but they could have other effects on business value. 3. Will the cost of capital increase or decrease? The cost of capital is a key part of valuing a business under the income approach. Certain provisions of the TCJA could affect a company’s cost of capital over the long run. The new law could lead to other changes to a company’s cost of capital. For example, if a company uses its tax savings to pay off debt or repurchase outstanding stock, it could affect the capital structure over the long run. Companies that transition to more equity financing could potentially increase the overall cost of capital (because the pre-tax cost of debt is generally less expensive than the pre-tax cost of equity). Those that transition to more debt financing would likely reduce their cost of capital. Value is often derived from projections of future financial performance. But projections based solely on historical data may not be relevant, because the TCJA significantly alters the status quo. When using management’s projections, it’s important to consider whether TCJA changes were factored in. If not, an expert might need to create his or her own projections — or ask management to revise its in-house projections. In some cases, internal accounting staff may not have the expertise to factor the effects of the new law into their projections. But some companies haven’t complied with this GAAP requirement, and others could potentially make erroneous income tax provisions due to a misinterpretation of the new law. Valuation experts need to evaluate these balance sheet items and consider whether they appear reasonable. Income approach. Some provisions of the TCJA are only temporary, such as the expanded depreciation breaks. And the new law could impact strategic decision making. So, an expert might opt to use discounted cash flow (DCF) techniques over the more simplified capitalization of earnings method. The DCF method generally provides for more flexibility in assumptions about growth rates and capital structure over the short term. Market approach. Care should be taken when applying pricing multiples under the guideline public company method. Public stock prices generally increased in 2017 — before the TCJA was enacted — in anticipation of lower tax rates. When applying public stock data, comparisons need to be apples-to-apples: A pricing multiple that’s based on the historical earnings of public companies shouldn’t be applied to a subject company’s projected earnings. Doing so risks double counting the benefits of the new law. The new tax law is likely to affect companies’ future earnings and business decisions. These effects will, in turn, trickle down to how much investors are willing to pay for a business interest. But the effects will vary from company to company. To discuss how the TCJA may impact the valuation of private businesses, please contact Gryphon Valuation Consultants, Inc. at (702) 870-8258.